Human beings depend on oxygen for life. All organs require oxygen for metabolism but the brain and heart are particularly sensitive to a lack of oxygen. The shortage of oxygen in the body is called hypoxia and a very serious shortage of oxygen for a few minutes can be dangerous or even fatal. Oxygen must be inspired from the air into the lungs. Oxygen must pass from the alveoli to the blood. This is called alveolar gas exchange. The blood must contain enough hemoglobin to carry sufficient oxygen to the tissues. The heart must be able to pump enough blood to the tissues to meet the body's oxygen needs. The volume of blood in circulation must be adequate to ensure oxygenated blood is distributed to all the tissues. There should be no change greater than 1-2% throughout your daily activities.Your blood oxygen level indicates how much oxygen your red blood cells are carrying. High blood oxygenation plays an essential role in ensuring that your muscles, brain and other organs receive the energy they need to function properly. Oxygen saturation (SpO2) measures how much oxygen blood carries in comparison to its full capacity. In other words, it’s an estimation of how much oxygen the hemoglobin in your blood actually contains compared to how much it could potentially contain. Pulse-ox represents this measurement using a percentage; so if your red blood cells contain 96% oxygenated and 4% non-oxygenated hemoglobin, your SpO2 would be 96%. It is perfectly normal for your SpO2 to minimally change throughout the day, particularly if you’re going from low-energy to high-energy activities. However, as long as your SpO2 stays within a healthy range amidst these fluctuations, there’s no need for concern. Normal SpO2 values should range from 95-100% O2 levels, most healthy individuals have an SpO2 of around 97-98%. So, knowing that your SpO2 fluctuates just a little by changing day-to-day activities, is there a way to get your SpO2 to change dramatically? What happens when you hold your breath, hyperventilate, or just change how you breathe? Do you think you can change your SpO2 values? What would happen if you could? Does yorur body have its own ability to regulate SpO2? 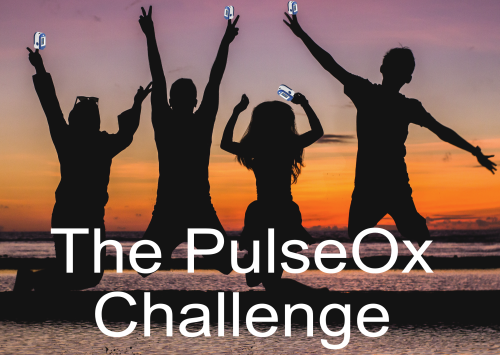 Take the Pulse-Ox Challenge and see if you can change your oxygen saturation levels!